My intention, as of late? To find self-love. I’ve recently gotten out of a four-and-a-half-year-long relationship, I’ve just completed with my Saturn Return chaos (you know, that major and trying life-change that happens around the age of 29), and I’m in need of a serious reboot of my sense of self-worth. While many newly exed may turn to boxing (the bag’s a great target) or hygge with a truly inspiring Netflix programming, yoga seemed to be the perfect outlet for my heartbreak. It’s not new to me, but there’s just something so relaxing about the sense of clarity that comes post-vinyasa. It’s something I wanted to explore further, and more consistently, once my life’s foundation seemingly shattered. Considering all the dark emotions and not-so-pleasant stories that were swimming through my mind—making work and other day-to-day functions that much more difficult—this was a welcomed experiment to clear it all out. And, though I’ve never been the type to “Om” in yoga or say “Namaste” at the end of class, I was ready to thoroughly immerse myself into the practice—woo-woo-ness and all. Keep reading to see how yoga helped emotionally, how it eases post-breakup pain, and how it brought me back to my feet (even after so many inversions). 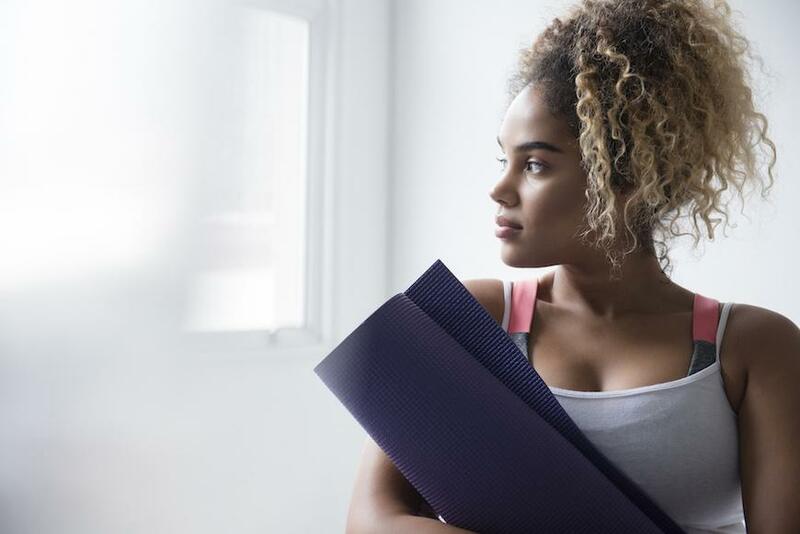 Yoga differs from other forms of exercise, because it’s about what happens outside of class just as much as within the 60 minutes of physical work. “Yoga’s about learning to sit with yourself even when you’re uncomfortable, and simply observe,” says Cooke. You know that burning feeling in your thighs when you’re in chair pose for longer than is pleasant? Teaching yourself to simply breathe through the pain can equate to learning to be comfortable in life’s many un-comfortabilities. There have been times where I’ll be in the office trying to write when I’m suddenly hit with a profound feeling of sadness. It’s disorienting and hard to overcome—I mean, the guy I used to share everything with is now completely gone from my life. It’s hard to work when I’m facing such traumatic emotions, but then I realize that I carry the basic tool of breath. As I’ve begun practicing yoga more regularly, I’ve started turning inward and focusing on my breath—only my breath—for at least a minute until the flood of emotions are shut with the gate of regained clarity. It’s powerful and it works (though it does take practice and consistency). As I get into countless downward-facing dogs, I gaze at my surroundings from my upside down viewpoint. When the blood rushes to my head, I realize that my life’s been turned upside down too—I’ve had to move from the apartment I shared with my ex for almost three years, lost the two dogs I mothered (he kept them), and I no longer have this person that was my complete support system. And yet—I try really hard on the mat to focus on the techniques yoga’s teaching me, and see that though the world’s upside down in this pose, my arms and my legs are still holding me up. I think to myself: I still have the power to stay lifted. And, physically, certain yoga poses can release emotional baggage. “Hip openers like pigeon pose are a great way to let go of negative feelings that don’t serve you anymore,” she says. With that newly clear mind, you’re less likely to spend that energy feeling down on yourself. “Take that energy to create a shift—this impact of yoga gives you more control over your mind, emotions, and your body,” says Cooke. For awhile during my practice, I would burst out into tears during savasana, since so many emotions came up during that hour of holding different poses. It’s as if they stirred up all the trauma going on in my life. But now, it’s pure release. When I stood upright in my last yoga class, with both feet firmly planted on the floor, I felt the gravity of my body and its ability to remain upright. And I realized I’m strong on my own. Here are the perks of practicing yoga without your mat. And this is how to avoid over-stretching (yes, it’s a risk! ).